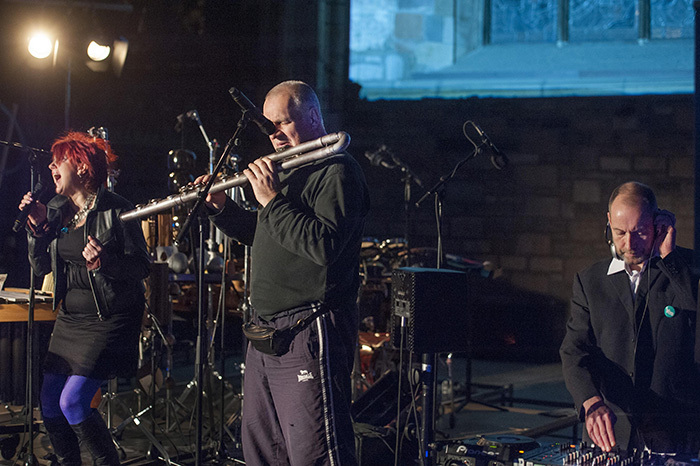 Playing to a packed St Giles Cathedral last Saturday (14 December 2013) was one of the highlights of this year for Dolphin Boy. Musically this was a brave new collaboration with classical flautist and composer David Heath and punk songstress Fay Fife (The Rezillos), but what made it all the more special was the added dimension of live painting by Russian artist Maria Rud and the projection talents of Ross Ashton. AniMotion received rave reviews in the press and you can read one of the most in-depth critiques at the Financial Times website. The AniMotion collaborators are currently considering offers to perform in other striking venues in 2014. Watch this space.